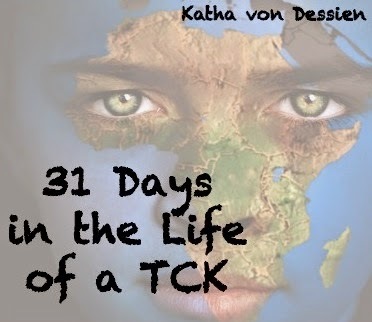 Welcome to 31 Days in the Life of a TCK! In the midst of state board examinations, organizing weddings and birthdays I have boldly accepted the challenge of writing every day in the month of October. However, I am not alone in this endeavor: I am linking up with Kate Motaung, who you might know as host of Five Minute Friday. The posts won’t be that long so you can read along easily. You can find the direct links to individual posts below. I am also linking up with TheNester, the platform for all the people taking part in the challenge as well. There are about 1000 of them writing on all kinds of topics – why don’t you go check out a few of them! The topic I have chosen for this challenge is 31 Days in the Life of a TCK. TCK stands for Third Culture Kids – people who grew up in multiple cultures, incorporating different elements in their lives, feeling they could belong everywhere and nowhere. You will hear stories about the different stages in my life (Germany-Uganda-Germany-South Africa-Germany-USA-Germany-…) and what I have learned along the way. You will get a glimpse into what it means to live between worlds and what TCKs might enjoy or struggle with. Even better, I hope to get some other voices of dear friends on board, too. Different countries, but with similar experiences and great insight. You can find more information on TCKs here. Otherwise just ask! I hope you enjoy going on this journey with me!